My interest in knitting has been kept alive over the years by the almost infinite variety of color, pattern, and texture that is found in collections of knitters and museums around the world. Although I love the smooth, quiet repetition of knitting a rectangular scarf in garter stitch using a luxurious yarn, it is the endless diversity of technique and style that keeps me interested in knitting as more than a way to keep my hands busy while watching TV. A picture is worth a thousand words, and sometimes a thousand stitches. Although language is one key to human thought and creativity, the visual focus of our senses is certainly another central part of being human. Most people would consider going blind to be one of the worst things that could possibly happen. We surround ourselves with colors that please us. Colors, as much as aromas and flavors, make our food appetizing. We paint our nails, dye our hair, powder our eyelids, and gloss our lips with color. As we flip through the pages of a knitting book, it is the colors of the garments that leap out and grab our attention. It is not only color that intrigues us, it is also the shapes and patterns depicted in the colors that intrigue, entrance, and inspire us. A red star means something different than a red octagon. A green leaf carries a different message than a dollar bill. A yellow butterfly attracts me; a yellow bee scares me. A purple flower is beautiful; a purple bruise is ugly. Color, shape, and texture combine to speak to us through our eyes. For as long as humans have been human, we have been drawing and painting pictures. From 5,000 year old cave paintings in France to 1970s subway graffiti in New York City, we always seem to find a way to express ourselves visually. 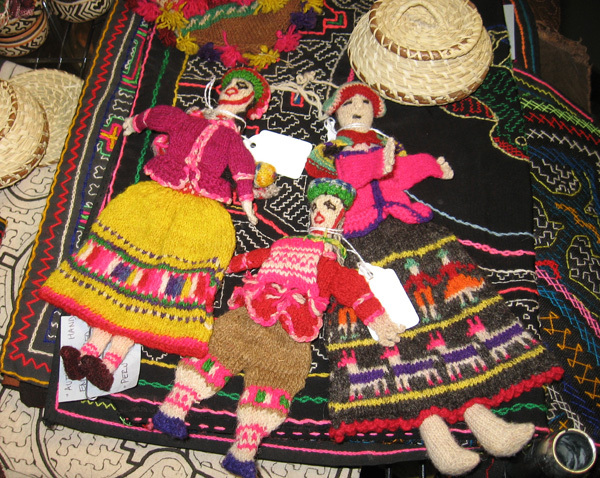 In the mountains of Peru, Bolivia, Chile, Argentina, and Ecuador, the Incas and their descendants have used brightly colored yarns to weave colors, shapes, and patterns into their clothing and accessories. When Spanish and Portuguese explorers, conquerors, and missionaries brought knitting to the Andes, the people of South America embraced it. Using llama and alpaca fiber, the Inca people began knitting intricate and colorful hats and bags to accompany their woven garments. 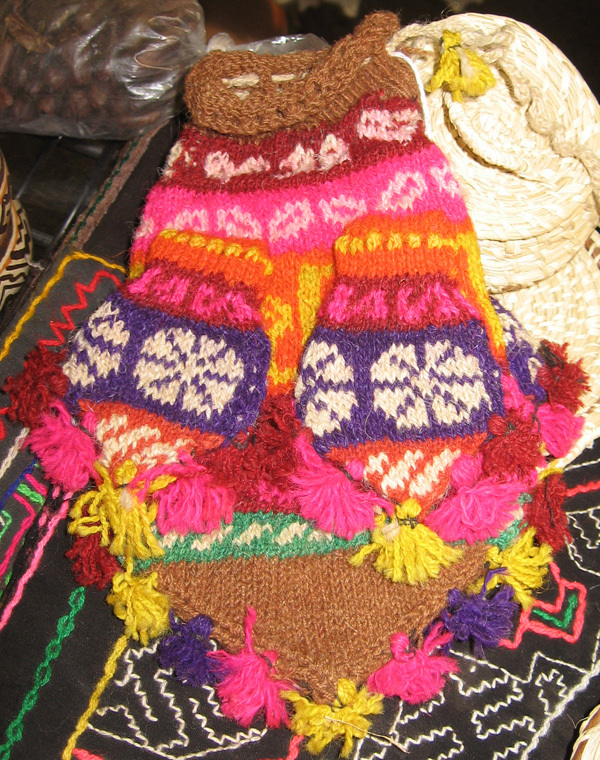 Women knit purses in many different sizes and shapes. Most are small, compared to North American pocketbooks, and they contain many tiny pockets to store change, small personal items, and amulets. The purses are knitted in the round, with stitches for the pocket openings knitted in scrap yarn that is later removed so stitches can be picked up to add the small pockets. Simple purses may be rectangular or oblong, with only one or two small pockets. Complex purses may be in the shapes of animals or people or in diamond shapes, and they often have many pockets. They may be decorated with tassels and coins for good luck. In the Andes, men and boys also knit. Men wear tight-fitted caps with ear flaps, known as chullos, that they knit for themselves. Boys learn to knit at a young age, and except for the first chullo each infant wears as a baby, a boy makes all of his caps himself. Using bicycle spokes or fine wires for knitting needles, they knit at a very fine gauge - sometimes as much as 20 stitches per inch (79 stitches/10 cm) - with multiple colors. The resulting caps are windproof. 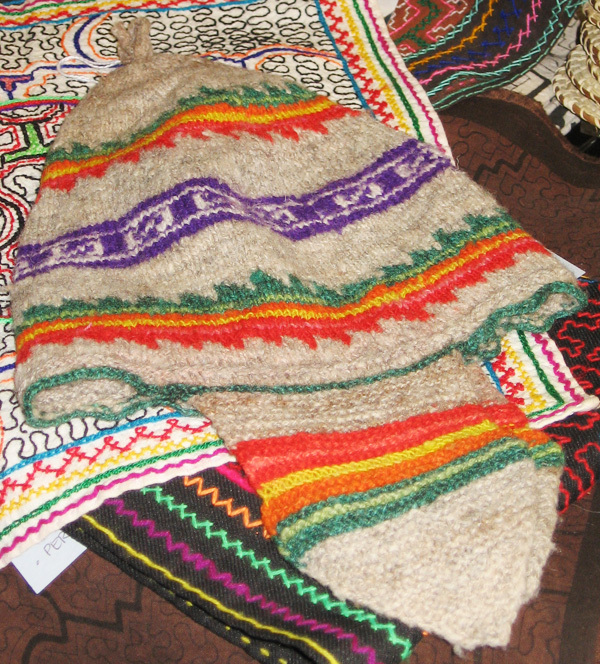 The chullos are knitted in the round except for the ear flaps, which are added after the main portion of the cap has been completed. Today, younger men and boys wear baseball caps over their chullos. 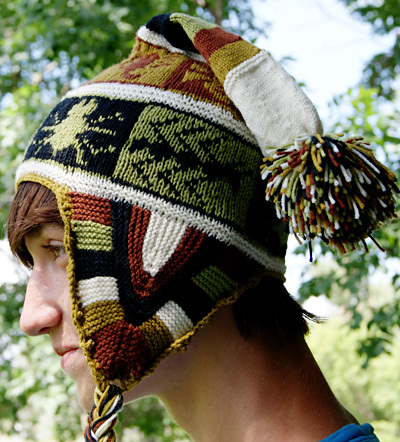 The colorwork patterns used on Andean caps, bags, and accessories cover a wide range of complexity. There are simple stripes and checkers, complicated geometric designs (such as zigzags and Inca crosses), and iconic representations of people and animals. Many of the symbols carry sacred meanings and have been in use for centuries in the mountains and plains of the Andes. Geometric Shapes: Zigzags may symbolize rivers or roads, which provide transportation through the mountainous terrain. They may also represent serpents, who bring wisdom and knowledge of the ancient past to the wearer, or earthworms, who bring fertility to the fields. Cross motifs are used to remember a recently deceased friend or loved one, as well as to provide protection over the fields during the growing season. The 8-pointed star motif was introduced by Europeans, while a squared-off star motif was used traditionally in pre-Columbian times. Flora: The coca leaf has been integral to Andean culture for millennia. Today, workers chew the leaves of the coca plant for stamina during a long dayâ€™s work. It is said that the leaves also provide relief for high-altitude sickness. Many other flowers are depicted in weaving and knitting motifs as well. 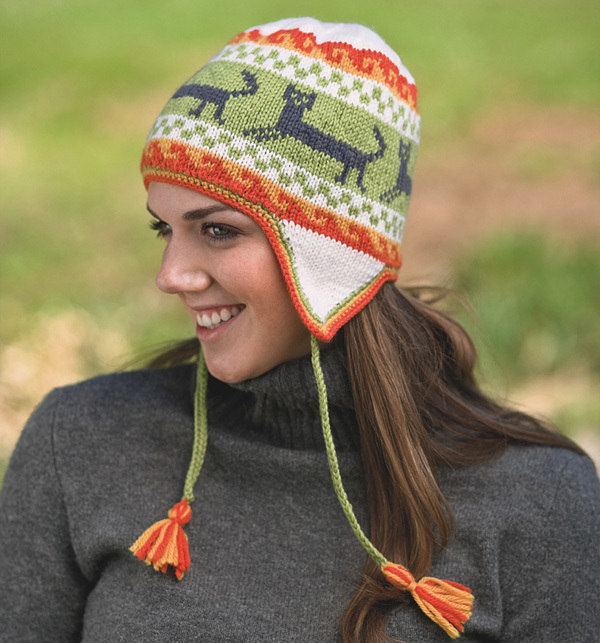 Fauna: Animal motifs are popular on Andean knitting. Guard dogs are used as protective amulets; birds bring good news; and livestock animals are reminders of the still-rural lifestyle in the region. The oldest motifs feature local animals such as llamas, alpacas, and condors. More recent designs also feature animals introduced to the region by Europeans such as cattle, horses, and sheep. Colors: For centuries, the Inca people used natural dyes. More recently, women have been using synthetic dyes to create brighter colors than are possible to achieve with natural dyes. Natural-colored yarns, made from the many shades of Alpaca and Llama wool, are also popular. 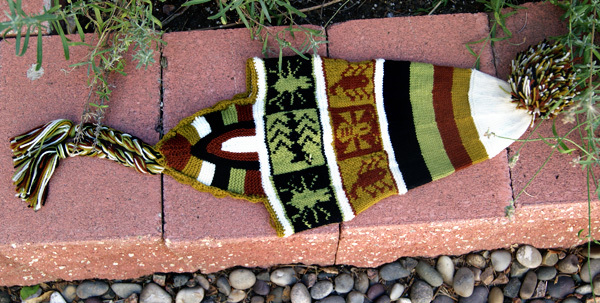 Colorwork patterns are very popular in the Andes, but lace knitting is not unknown and some of the pictorial motifs have been converted into lace patterns by Andean knitters as well as by North American designers. This chullo is decorated with motifs of creepy-crawly critters from the Andes. The colors remind me of the desert landscape in which these creatures can be found. The pattern arrangement, with the pictorial motifs arranged in alternating dark and light rectangles is known as tocapu. 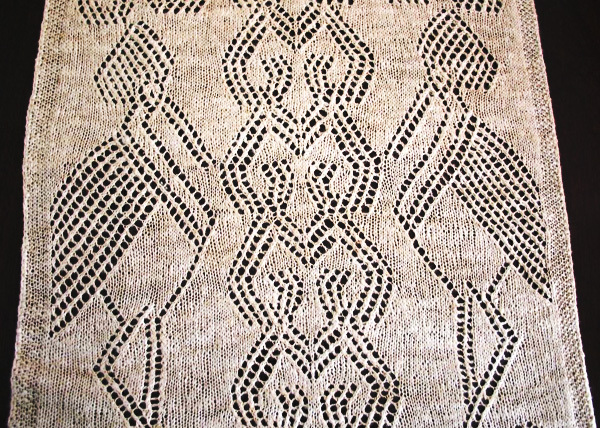 This style of design originated in woven belts, and was later adapted to knitting. Using traditional techniques, the earflaps are knitted first in garter stitch. First a long strip is knitted, then it is formed into a curve by picking up stitches on the side of the strip and decreasing in the center. The final join is completed with three-needle bind off. Stitches are picked up across each ear flap for the sides of the hat and cast on between flaps for the front and back of the hat. 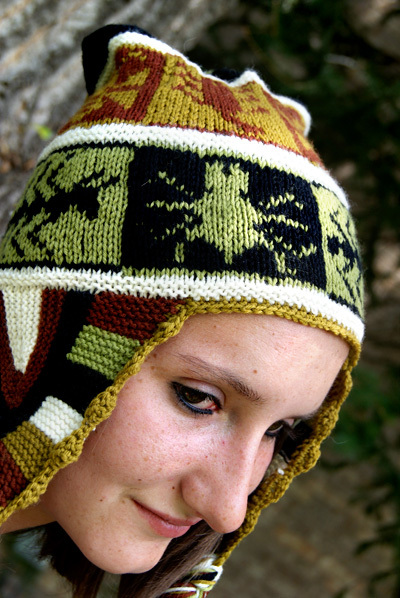 The remainder of the hat is knit in the round, with decreases spaced evenly for the crown shaping. A crochet edging, tassels, and pompom are added after the knitting is complete. Note: Different sizes are made by working at different gauges to maintain integrity of the charts. Instructions for making a pom-pom can be found here. With color MC and smaller needles, CO 10 sts. MC, CC1, CC2, CC3, CC4. Note: No wrap and turn or other special technique is needed when turning. Rows 2 & 3: K9, turn, knit to end, turn. Rows 4 & 5: K8, turn, knit to end, turn. Rows 6 & 7: K7, turn, knit to end, turn. Rows 8 & 9: K6, turn, knit to end, turn. Rows 10 & 11: K5, turn, knit to end, turn. Rows 12 & 13: K4, turn, knit to end, turn. Rows 14 & 15: K3, turn, knit to end, turn. Working in reverse order, repeat rows 16 to row 1 once more. K10 rows of each color in this sequence: CC4, CC3, CC2, CC1, MC. With RS facing, color CC2 and smaller needles, pick up and knit along the inside curved edge of piece: 25 sts for straight section, 3 sts at corner, and 25 sts for second straight section. 53 sts. Row 1 [RS]: K24, k2tog, pm, k1, pm, k2tog, k to end. 51 sts. Decrease row: K to 2 sts before first marker, k2tog, slip marker, k1, slip marker, k2tog, k to end of row. 2 sts decreased per row. Work Decrease row 4 more times. 41 sts. Change to MC. Work Decrease row six times. 29 sts. Change to CC3. Work Decrease row 1 six times. 17 sts. Fold work at decrease point of row. With RS held together, work a three-needle BO across 16 sts, and BO final (center) stitch. With CC3 and larger needles, pick up and knit 35 sts across top edge of first ear flap, CO 28 sts, pick up and knit 35 sts across top edge of second ear flap, CO 28. 126 sts. Join for working in the round. [Knit 1 round. Purl 1 round] twice. Work all rounds of Ants & Spiders Chart. Using CC3 [Knit 1 round. Purl 1 round] twice. Decrease round: With CC, ([K2, k2tog, k1, k2tog, k2, k2tog] 6 times, [k2, k2tog] 3 times) twice. 114 sts. 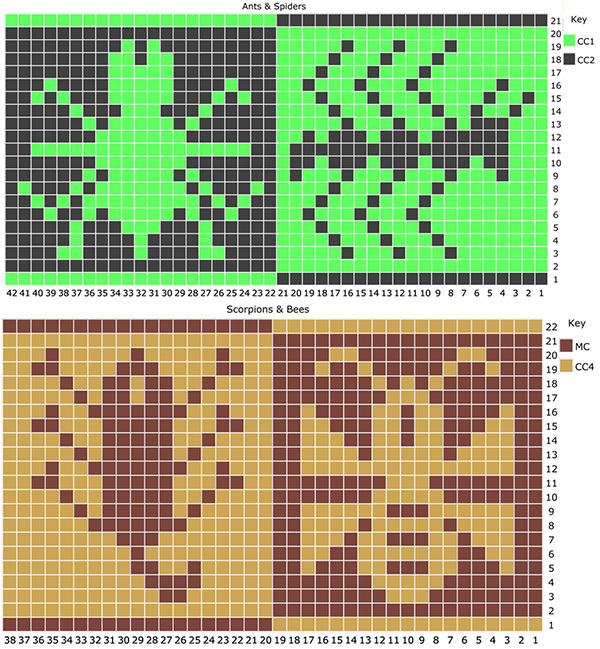 Work all rounds of Scorpions & Bees chart. Round 1: With CC, [k55, k2tog] twice. 112 sts. Round 2: [K12, k2tog, pm] around. 104 sts. Round 15: [K to 2 sts before marker, k2tog] around. 96 sts. Work Round 15 again. 88 sts. Work Round 15 again. 80 sts. Work Round 15 again. 72 sts. Work Round 15 again. 64 sts. Work Round 15 again. 56 sts. Work Round 15 again. 48 sts. Work Round 15 again. 40 sts. With RS facing, using CC4 and crochet hook, join yarn to bottom edge of hat at center back. Work 1 round of crochet as follows: *sc in next st, hdc in next st, dc in next 2 sts, hdc in next st; rep from * around. Join to first sc with sl st. Fasten off. Cut 16 pieces of yarn approximately 24 inches long. Pull the strands through the crochet stitch at the bottom of the earflap and then split into three strands and braid together. Cut a 6-inch piece of any color yarn and use this to tie off the braid. Repeat on the second earflap. Make a pompom approximately 2 inches in diameter, using a pompom maker or a piece of cardboard. Sew to top of hat. Weave in ends. Wash and dry flat to block. Donna Druchunas escaped a corporate cubicle to honor her passions for knitting, world travel, research, and writing. 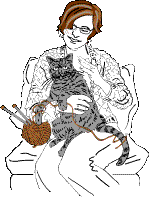 She is the author of six knitting books including Arctic Lace, Successful Lace Knitting, Kitty Knits, and Ethnic Knitting Exploration: Lithuania, Iceland, and Ireland. She teaches in the United States in Europe and now offers online sock-knitting classes at Craftsy.com. Visit Donna's website at sheeptoshawl.com.